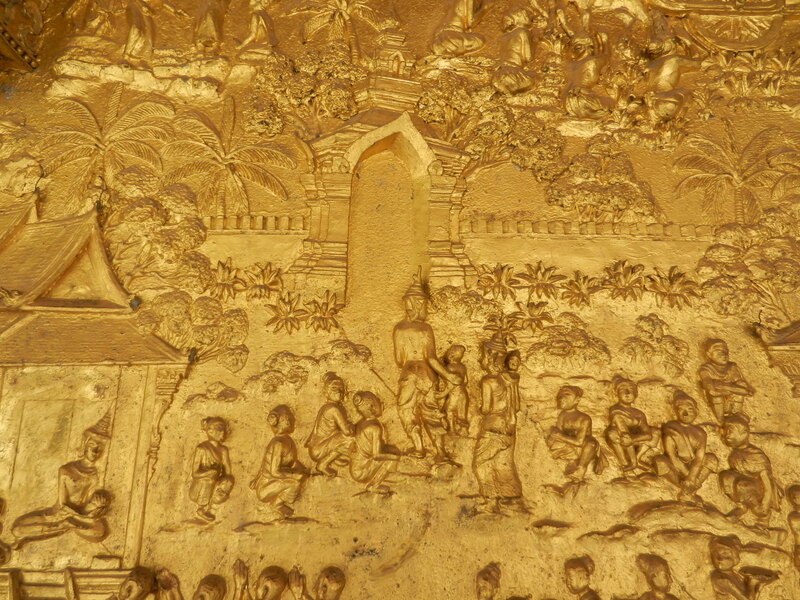 The kings of Laos’ Lan Xang Empire unified their realm by importing Indian traditions, like Buddhist monasteries and court dances that dramatized the Ramayana. 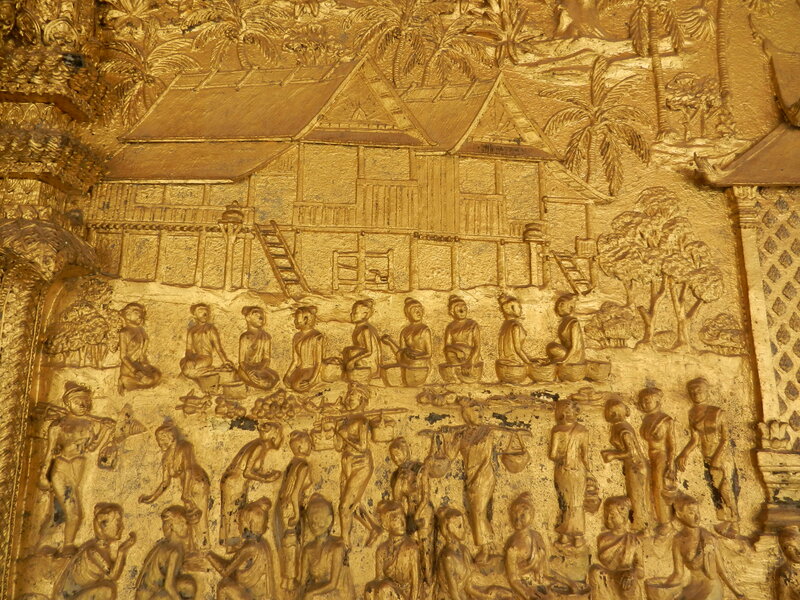 But Laos quickly added its own cultural wealth to these currents and created a landscape that was (and is) both vibrant and beautiful. The public assembly hall of Wat Mai (above) was finished in 1788 or 1794, and it housed the Phra Bang Buddha statue from 1894 to 1947–the most honored religious image in Laos, which protects the country. The royal palace (the national museum since the 1975 Marxist takeover which ruthlessly deposed the king) presides next to Wat Mai. 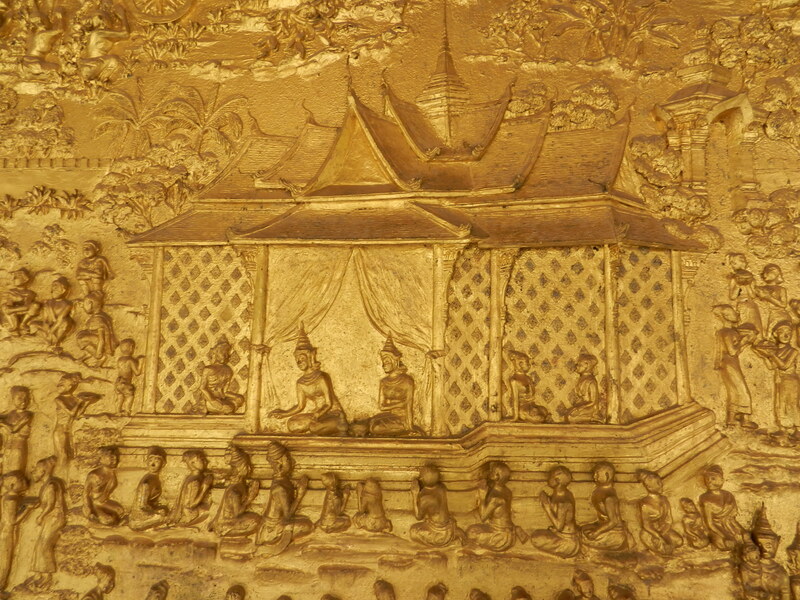 So key royal and Buddhist rituals were coordinated. 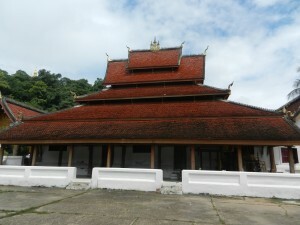 The hall’s graceful stack of five roofs is a Lao design, which added soft touches to the grand rituals. 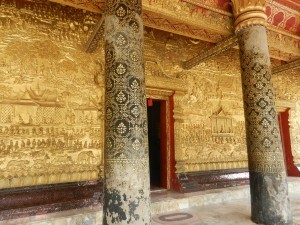 But most fans of Laotian and Buddhist art think that Wat Mai’s greatest treasure is the veranda in front of the entrance. 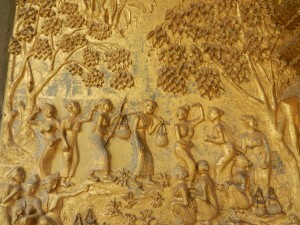 The golden bas reliefs around the entrance were made in the 1960’s. A close look at them brings you into a perspective of the world that blends regal splendor with folksiness. 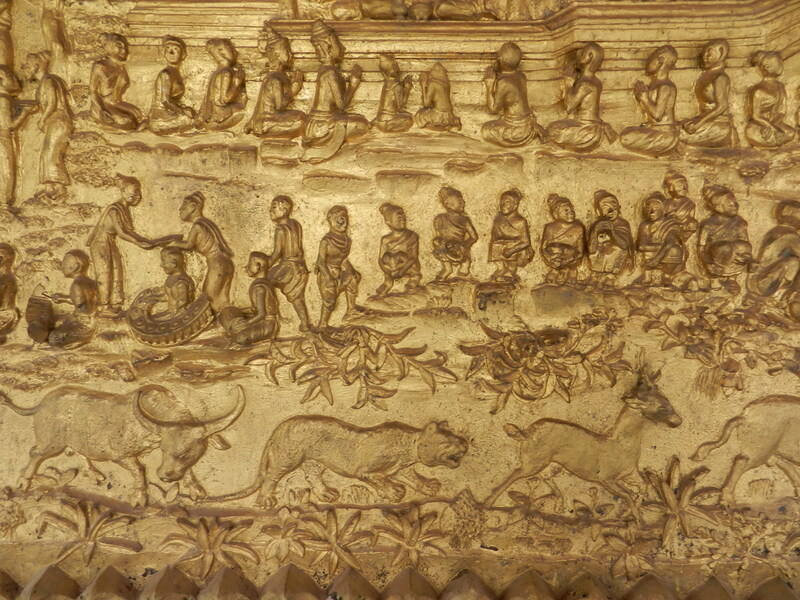 just under the palace are casual images from daily life, and under the bottom row of people, animals and foliage blend with each other. There are no sharp divisions between domains–the kingly, the common and the natural seamlessly fuse. The Buddha’s compassion embraces all, and all life-forms have their own dignity. 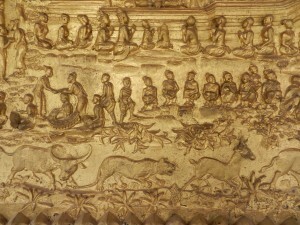 The Vessantara Jataka integrates both worlds very well. Vessantara was a prince whose neignboring kingdom was suffering from a drought. He gave it his state’s white elephant because it had mystical powers to bring rain. The people of Vessantara’s country were so angry that his father, the king, was forced to banish him from the realm. In the above photo, he, his wife and children wander through the countryside. The countryside is very attractive and realistically shown. And it takes up much more space in the friezes than the court scenes. And common people are given as much as dignity as the royals. 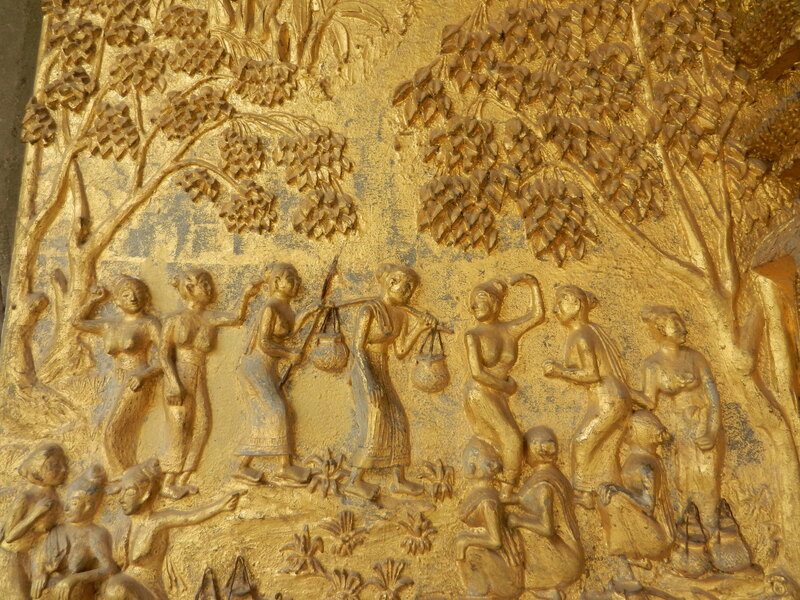 Village women gather fruit in the above photo, and some seem to perform a fertility dance. 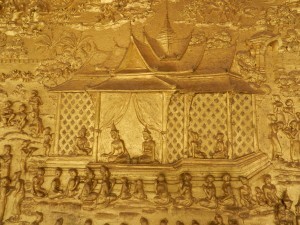 The annual recital of the Vessantara Jataka has been one of the most important events in Luang Prabang’s ritual calendar for untold centuries. 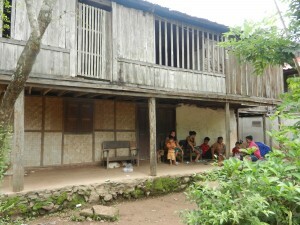 But on Wat Mai, the story is immersed in happy village life. First rate elegance and folksiness together–is there a better perspective of the world? 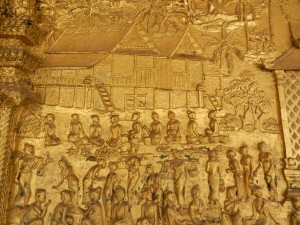 Northeren Thailand also mixed both in many art works. So did Yunnan. This general area is one of my favorite parts of the world. Several kingdoms flourished for many centuries and traded goods, arts and ideas with each other. This region is full of some of the world’s finest cultural treasures, which are little-known.